The team will develop a thermally powered supplemental cooling system for thermoelectric power plants that will enable dry cooling. 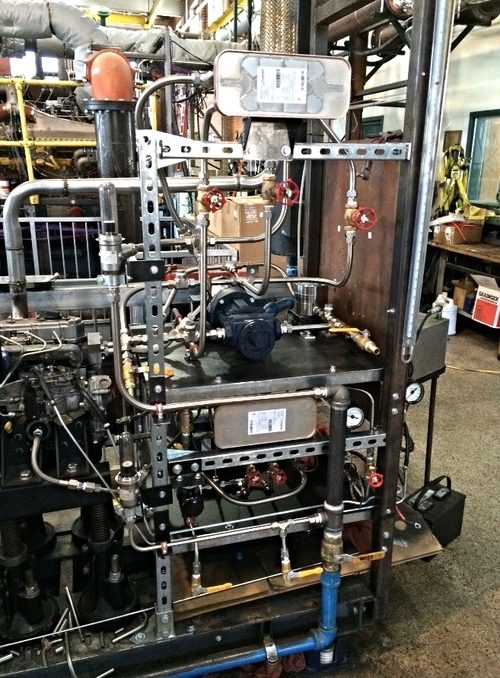 The technology features a transformational turbo-compressor and low-cost, high-performance heat exchangers that are currently mass produced for the HVAC industry. 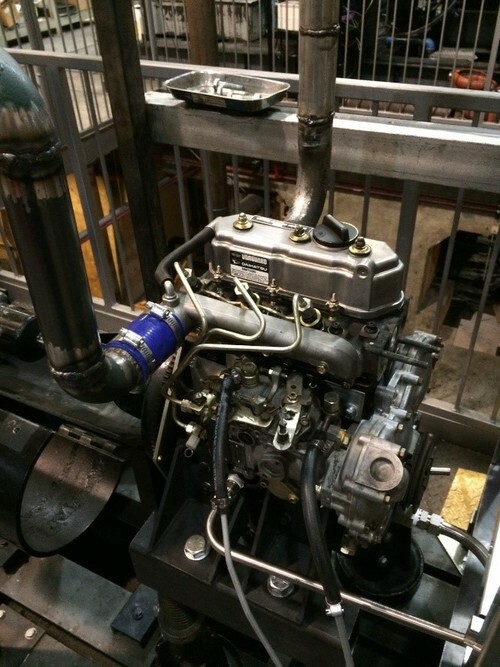 To operate, low-grade waste heat from the power plant combustion exhaust gases, or flue gas, is captured and used to power a highly efficient turbo-compressor system. The compressor pressurizes vapor in a refrigeration cycle to remove up to 30% of the power plant cooling load. The cooling system utilizes proprietary technology to maximize the turbo compressor and total system efficiencies, enabling a low production cost and an overall smaller, less expensive dry-cooling system. As a result, the cooling system could allow thermoelectric power plants to maintain a high efficiency while eliminating the use of local water resources. Furthermore, due to its very high performance, the turbo-compression cooling system has potential applications in a range of other markets, including commercial HVAC systems, data center cooling, and distributed cooling industries. As electronics trend towards increased miniaturization and greater performance, the need for high-performance cooling of becomes critical. Waste heat generated by microprocessors, laser diodes, and other electronics must be removed from the device to enable optimal functionality and avoid catastrophic overheating. As devices get smaller and performance demands increase, the resulting heat fluxes become extremely high. Sophisticated heat-removal technologies must be employed to manage such fluxes by dissipating heat to the ambient at a rapid rate. Torben’s research focuses on research and development of such high-performance cooling techniques. He uses finite element analysis (FEA) software to create models of devices and the associated cooling structures. The models are a powerful tools for optimization of cooling techniques because they permit one to examine performance for a large assortment of configurations and parameters without manufacturing and testing physical devices. Moreover, results from experiments conducted by other lab members can be incorporated into the model to improve the realism and applicability of the results. The models provide valuable capability in ITS Lab’s effort to develop new and ever-higher performance cooling technologies. With electronics becoming smaller and ever more powerful, Torben’s research is working to meet the need for correspondingly improved cooling technologies. Steam methane reforming (SMR) is an industrial power generation process that converts natural gas to hydrogen, separates the hydrogen through a palladium membrane, and burns it to extract energy. The process has enormous potential for waste heat recovery, CO2 sequestration, and reduction of capital cost. The goal of this study is to investigate the technoeconomic feasibility of an optimized SMR system with CO2 capture relative to other carbon-free power generation technologies. A thermodynamic model was developed to design and analyze chemical reactions, power generation, and waste heat recovery. The model is currently being validated using experimental data from a 100 W scale test facility built at Colorado State University. The overall system efficiency is currently at 43% and may be driven higher at elevated pressures. The cost of implementing SMR at the industrial scale is largely driven by the material cost of the hydrogen-selective palladium membrane. The amount of palladium in this system is extremely small due to a novel porous sintered steel support and uniform palladium deposition by electroless plating. Therefore, the capital cost and Levelized Cost of Electricity (LCOE) are significantly lower than existing SMR systems. At a 6 MW scale, the LCOE of a SMR system with CO2 sequestration can be as low as $139 / MWh. This is competitive with other carbon-free power generation methods including industrial solar photovoltaic ($140 / MWh), solar thermal ($139 / MWh), and fuel cells ($137 / MWh). This study proved that an optimized SMR system at the industrial scale is an economically competitive carbon-free power generation technology. In this effort, Colorado State University and the Colorado School of Mines are developing an a low-cost system that can simultaneously produce electricity and separate CO2 from natural gas at scales relevant for distributed generation. The team is (1) developing a detailed cost estimate for a system at the 50 kWe scale, and (2) documenting heat integration concepts. Since the beginning of 2017, the team has begun designing and fabricating a system at a 100 W scale for proof of concept demonstration. Test results from this facility will be used to guide the estimate of a scaled up version. 6 MWe is a relevant scale for economic estimation, and thus the team has begun developing various heat integration concepts for the system and the membrane reformer. Manufacturers continue to make incremental gains in internal combustion engine efficiency, but as much as 60% of the fuel energy may still be rejected to the environment as waste heat. Research on recovering this waste heat has produced disappointing results due to the low heat capacity rate of the exhaust gases and the low temperature of the coolant (~90°), which limit the average relative efficiency gains to less than 10%. Increasing the engine coolant temperature would greatly increase the availability of waste heat and could result in efficiency gains of over 20%. Therefore, I am building an experiment using a small diesel engine to measure the availability of waste heat as the engine coolant temperature is incrementally increased. An energy balance will be performed on the modified Daihatsu three-cylinder diesel engine, which uses a copper head gasket, upgraded engine oil seals, and custom oil and cooling systems. The results from the experiment will then be used to model the output of a waste heat recovery system and demonstrate the possible efficiency gains. The high thermal conduction resistances of lithium-ion batteries severely limits the effectiveness of conventional external thermal management systems. To remove heat from the insulated interior portions of the cell, a large temperature gradient is required across the cell, and the center of the electrode stack can exceed the thermal runaway onset temperature even under normal cycling conditions. One potential solution is to remove heat locally inside the cell by evaporating a volatile component of the electrolyte. In this system, a high vapor pressure co-solvent evaporates at low temperature prior to triggering thermal runaway. The vapor generated is transported to the skin of the cell, where it is condensed and transported back to the internal portion of the cell via surface tension forces. 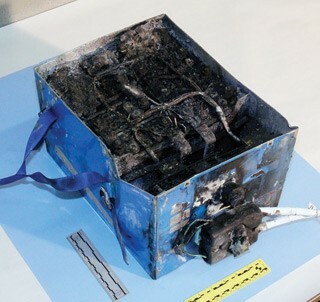 For this system to function, a co-solvent that has a boiling point below the thermal runaway onset temperature must also allow the cell to function under normal operating conditions. Low boiling point hydrofluoroethers (HFE) were first used by Arai to reduce LIB electrolyte flash points, and have been proven to be compatible with LIB chemistry. In the present study, HFE-7000 and ethyl methyl carbonate (EMC) are used to solvate 1.0 M LiTFSI to produce a candidate electrolyte for the proposed cooling system. Lithium titanate oxide (Li4Ti5O12), copper antimonide (Cu2Sb), and lithium iron phosphate (LiFePO4) are used in half and full cells with the candidate electrolyte for cycling and electrochemical impedance spectroscopy tests, and testing results show similar performance characteristics as compared with a conventional carbonate-only electrolyte (1.0 M LiPF6 in 3:7 ethylene carbonate/diethyl carbonate). The same battery active materials are evaluated in a custom electrolyte boiling facility to evaluate electrochemical performance, and test results show that full electrochemical cells operate similarly even when a portion of the more volatile HFE-7000 is continuously evaporated. Five commercial lithium-ion batteries (LIB) were disassembled and analyzed for specific physical and electrochemical parameters. Cell disassembly was completed in an Argon glove box. Detailed measurements were performed on the physical construction of the batteries with the goal of determining the volume of active material in each electrode. The open circuit potential (OCP) as a function of temperature and state of charge (SOC) for the cathode and anode active materials versus Li/Li+ was measured. These tests used ¾” half-cells cycled at a C/30 rate on an Arbin battery tester while under strict environmental temperature control. The diffusion coefficient of Li+ as a function of temperature and SOC in the active materials was measured using the Galvanostatic Intermittent Titration Technique (GITT). Nuclear Magnetic Resonance Spectroscopy (NMR) was used to determine the composition of the electrolyte, if enough of an electrolyte sample was harvested during cell disassembly. Extensive Scanning Electron Microscope (SEM) imaging was performed on the electrodes to determine the coating thickness and active material particle size. Additionally, Energy Dispersive Spectroscopy (EDS) was performed on all electrode samples to determine the elemental composition of the active materials. This data was then coupled with X-Ray Diffraction (XRD) crystallographic data to produce an equivalent unit cell of the active material in order to determine the theoretical lithium storage capacity. The composite electrode electronic conductivity was also determined as a function of temperature with a Gamry Reference 3000 Potentiostat.